singlespolitics: Singles: News-Editorial: Award-Winning Evansville Photographer: Molly Bartels specializing in editorial, wedding and art photography in Evansville, Indiana. 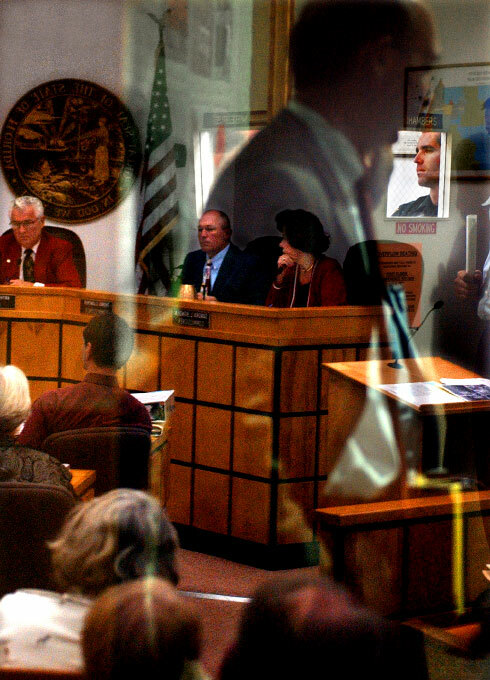 Local citizens waiting in an over flow area are reflected in a door window at the entrance to the Indian River County Commission chambers at the County Administration Building in Vero Beach on Tuesday, December 14, 2004. The commission held a public hearing on a proposed moratorium that would delay rezonings and site plan approval for new residential areas. Indian River County Sheriff's deputy, Christian Mathisen, top right, monitored the chamber, which was at capacity.